Sidney Lumet's classic Fifties film, "12 Angry Men" has been remade by Nikita Mikhalkov. 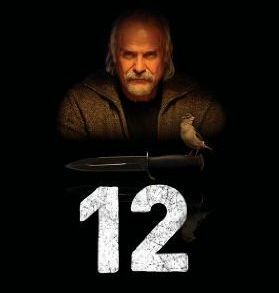 "12" won an Oscar nomination as Best Foreign Language Film for 2008. The basic narrative of each film has a jury of 12 men, all from different walks of life, deciding the fate of a young man accused of murder. Almost the entire picture is a running discussion of whether or not he's guilty. With a small budget, Lumet kept "Angry Men" to just a bit over 90 minutes. Mikhalkov has a briefer title for his film but, as any Russian play would guarantee*, that's all the brevity there is. The story originates from a mid-50s CBS teleplay by Reginald Rose and makes an implied connection with those infamous congressional hearings fomented by Senator Joseph McCarthy. Milhalkov, working with two Russian screenwriters, brings the story into the 21st century with its changing effect on citizenship and the law after the collapse of Communism. A musical metaphor may be the best way to contrast the Lumet film and Milhalkov's 2-hour 39-minute version. "12 Angry Men" is a movement from a Bach string quartet played by the Modern Jazz Quartet, and "12" is a fully-scored Shostakovich orchestral piece that plays in concert with a dozen soloists, who, in turn, reveal themselves in a first-class display of Grand Cinema. Edward Artemiev's actual film score doesn't get in the way of all that, yet is fully orchestral in its rich and tonal harmonic texture. That most all of the jury deliberation of the Russian embellishment takes place in a rundown school gymnasium seems incongruous, at first. The courthouse where the trial has been proceeding is under some renovation. The gym gives Milhalkov and his camera the freedom to move about the jurors, giving the film internal movement and opening up opportunities for action. It's handled skillfully, but still doesn't cover the naturally theatrical foundation on which Rose's teleplay rests. And to my eye, some of the action in "12" seems forced as it "looks over its shoulder" at the intrinsic quality of its immobility. It seems a given that Milhalkov was looking to America for part of the attention his fine work would be receiving. Therefore, it could be argued that cast members' significant speeches should have been less long or, if possible, a slower delivery given to each soliloquy. At some moments in "12," I had to pause the DVD in order to freeze the fly-by subtitles for complete English comprehension. Since cinema seats don't have pause buttons---yet---I'm glad I didn't have to watch the film on a big screen. But that didn't give me the opportunity to fully ingest the cinematic values of Milhalkov's film. Cinematography, lighting, framing, editing: all top notch; and all Russian actors giving nothing but a superb performance. All much different than the greats seen in the mid 50s version: Henry Fonda, Lee J. Cobb, Ed Begley, Jack Warden, Jack Klugman, E.G, Marshall, Edward Binns and Robert Webber. The contemporizing of "12" also effectively brings into play the war in Chechnya, globalization, western influence, capitalism and, as did "Angry Men," race and anti-Semitism. The more current events are used by Milhalkov to externalize and mobilize his film. This American teleplay made into a Russian play is dense and probably needs at least one or two subsequent viewings to gather it all in. There's much to gather, and without giving away much of anything, here's the closing quote of the film written in English: "The law is all powerful and constant but what can be done when mercy has greater force than law?" "12" official site. Opens June 12 at the Circle Cinema. Copyright © 2009, Gary Chew. All rights reserved.